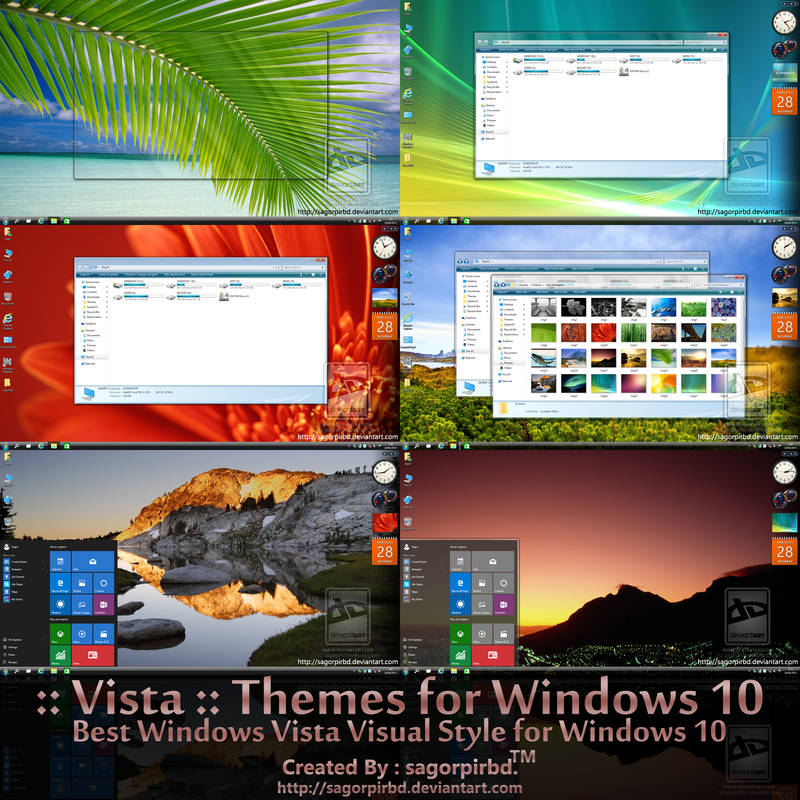 "Vista Aero" & "Vista Basic" Themes for Windows 10. 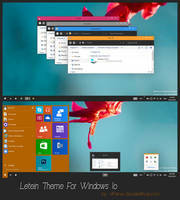 "Vista Aero" & "Vista Basic" Visual Style for Windows 10 RTM Build 10240, Build 10586 & Windows 10 Anniversary Update Build 14393 (X86)32 bit & (X64)64 bit Systems. Big UPDATE ( 22 September 2016 ) : "Vista Aero" & "Vista Basic" Themes Now Support Windows 10 Build 14393 Anniversary Update. 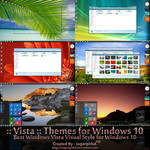 UPDATE ( 11 December 2015 ) : "Vista Aero" & "Vista Basic" Themes Now Support Windows 10 Build 10586 November Update. 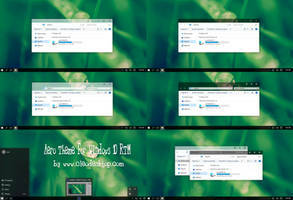 Now Unzip & Copy "Vista" folder to : C:l Windows:l Resources:l Themes folder. 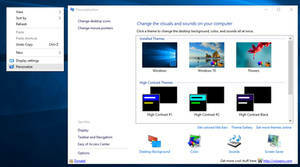 Now Go to Desktop Personalize & apply "Vista Aero" or "Vista Basic" theme. 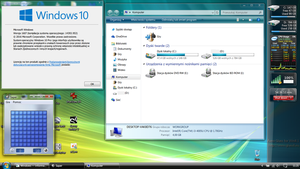 Windows 10 (X86) 32 bit & Windows 10 (X64) 64 bit . Actually, is there a way to make the window frame opaque when maximized like in the original Vista? Awesome work! ^_^ I downloaded the RAR folder, & added the themes to my computer, but I have a question before I turn any of them on: Will they interfere with the AeroGlass or Aerolite theme settings & stuff that I currently have activated on my computer? I am so close to getting this to work, just the address bar isn't changing for some reason. Aero effect does not work. 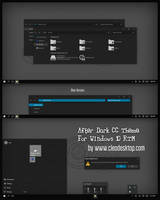 Black screen, crtl+alt+del didn't work, ctrl+shift+esc didn't work. Nothing. i just went ahead and tested this theme on 1809, and apart from missing title text on explorer this theme seems to work just fine. however as i said, i just installed it. no more than like 10 minutes ago, so i can't be sure if there is some errors or bugs hidden. but at least on my 64bit windows 10 pro 1809 system, it doesn't seem to have done any harm. edit: missing title text seems to be caused by oldnewexplorer, not by this theme. 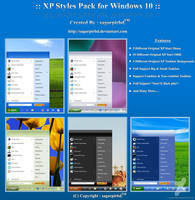 UxStyle's installer is being blocked by the OS, claiming that "this app can't run on your PC." Does anyone know of any work-arounds? has anyone tested this with the latest 1809 update yet? I haven't, but if i wanted id use a virtual machine. I love the themes of Windows Vista, 7 and 8. 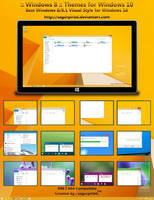 You will be very grateful to you to keep the issues updated in the next versions of Windows 10. 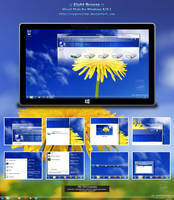 Sincerely I am very grateful, we have the opportunity to visually relive our old operating systems thanks to you . I wish him well. 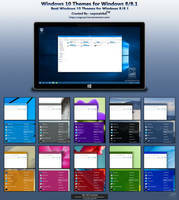 Confirmed to work with latest (contemporary) Windows 10 x64 Version 1803. 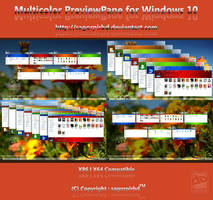 If you have any problems where the theme appears to do nothing once applied, there was most likely an issue with the installation of Ultra UX Theme Patcher; if so, check the FAQ page on the patcher-developer's website located at www.syssel.net/hoefs/software_… to further troubleshoot your issue. And yes, I said "Ultra UX Theme Patcher", not the potentially outdated patcher linked on this theme's post. Thank you for this classic theme . Also, for those who do want to buy StartIsBack to further customize Windows, check out Open-Shell github.com/Open-Shell/Open-She… as it provides the same functionality (start button and taskbar skinning) but for free. You will need to acquire the taskbar skin and start button from another source because the StartIsBack skin files are incompatible with Open-Shell. Wow, thank you for the tips! This also applies to Aero Glass 10, right? I haven't tested Aero Glass 10, but assuming its last update was around a similar time as this theme's (i.e. updated for the Windows 10 "Anniversary Update") then it should work fine. If you are very concerned then you can create a restore point in Windows and return to that point via Safe Mode if problems do occur. Sagorpirbd's themes seem to have stood the test of time thus far . 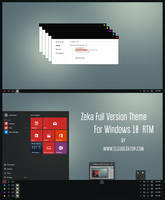 if this theme works in Windows 10 1709? yes and so far it seems to work fine with the 1803 spring 2018 update too. you just need to use oldnewexplorer and also ribbon disabler to get the same look as in the picture. just remember that there isn't stable glass8 for the 1803 yet, so you need to either go on without it (for now) or use the beta version that has that forced cmd command console open and glass8 watermark on the desktop. you can however hide the debug console on to the second virtual desktop, then you wont even know that it is on. Can someone help me download this? I try using the download button in the sidebar but it just brings me to the deviantart 404 page. Thanks! Nevermind, I fixed it by searching for it in the search bar. can you make this a registry tweak for creators update? 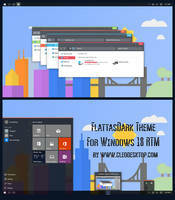 Hi, I am having an issue getting this Vista theme and your other Windows 7 theme to work under Windows 10 Creators Update. I have patched using the latest UltraUxthemePatcher, and purchased StartIsBack in addition to Glass8 (which works fine now by the way). I will attach a picture, as you can see the top window doesn't appear to change; it stays as the default Windows 10 look with the aero effect applied. Might you know how to fix this? Very much appreciated!! 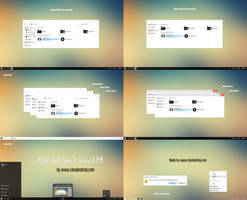 EDIT: I accidentally installed Aero glass theme during Glass8 installation. Reinstalling it and unticking this option fixed the problem, and the windows appear as they should. Hey man, super excellent theme. 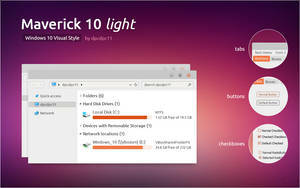 Is there any way to edit it so that startisback will use the Windows 7 buttons and userframe? Just so that it'll be a little closer to the way Vista actually looked. Thanks! Hi! I faved it! And thanks for your amazing job! You just beat windows! I don't succeed to have the bar on the bottom of the pictures like the one in your preview. (I mean where is the battery, The Internet icons and so forth) If you have any tips to complete the process thanks you anyway! That's the limitation of windows 10 and you have to live with it! I've kinda modified the windowmetrics settings to tune the titlebar buttons size, so it's kinda ok. Now if only to somehow make the close/min/max to have the exact width like in vista + tune up the margins of it. Thank you SO much! I still have my main PC with Vista and my other PC I've got WinX on it now and I hated it so much! But it is starting to look a lot like Vista. YAY!!! Some problems though - taskbar and startmenu look good, but the startmenu has a square profile picture if I choose the win7 theme, but it turns round when I choose the Vista theme. I prefer the square one. Is there a way to get both the Vista taskbarstyle ánd the win7 profile picture? 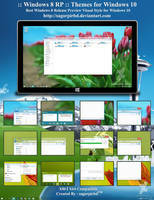 Also my explorer doesn't have the nice rounded look of Vista I see in so many screenshots, but like a transparent winX. I have installed NewOldExplorer (and I've read all the comments before posting LOL), so I'm a bit at a loss. Will this be updated for the creator's update? SURE! why not but need time. i have been using this theme on my creators update since day one, you just need to use that anniversary one in the pack otherwice there might be problems. You mean anniversary update version (Build 14393) themes works fine in creators update ? At least your Vista and Windows 7 themes seems to be working fine in my computer with the creators update installed. 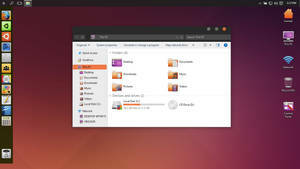 Could I ask if you could made version of this theme, that had the default dark color in the win + X menu. I get that that color is changed because you wanted to make it look close as possible to the windows vista, but if you could made separate theme file that had the default windows 10 color in the win +X and the Taskbar menu. What do you mean by -->> win + X menu ??? This menu that opens either by rightclicking start button or by pressing windows key + letter X.
that menu is dark in the default windows 10 theme. 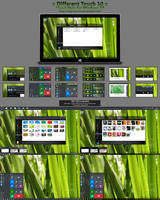 could you possiply restore that in this and on that windows 7 theme too, not by replacing this current theme as i understand that this is more on that "let's make this look 100% like windows vista did", but if you could add that as a separate file inside this theme pack it would be awesome.